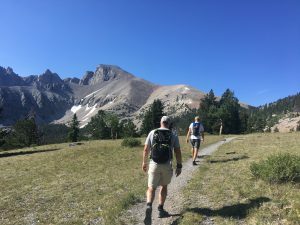 The Plan: Reach the summit of Wheeler Peak, the second-highest point in the state of Nevada, and the jewel of Great Basin National Park. 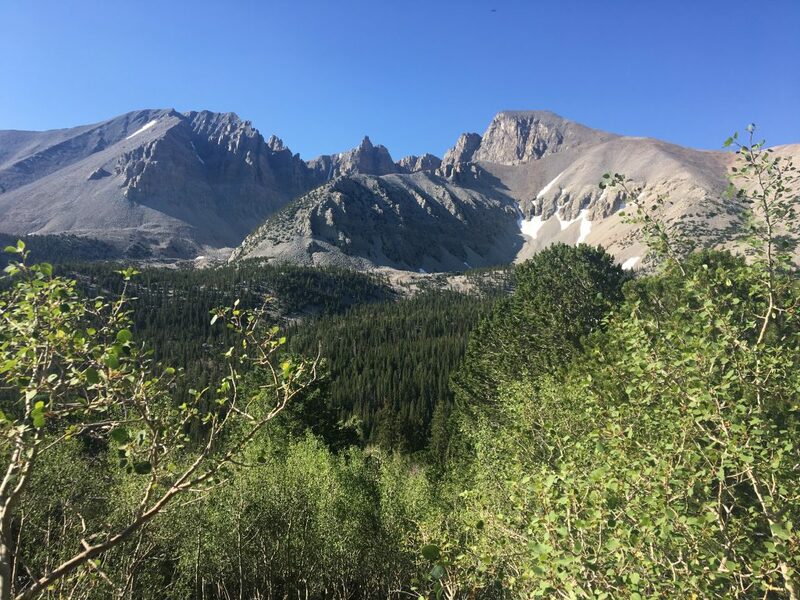 Wheeler Peak, from early on the trail. 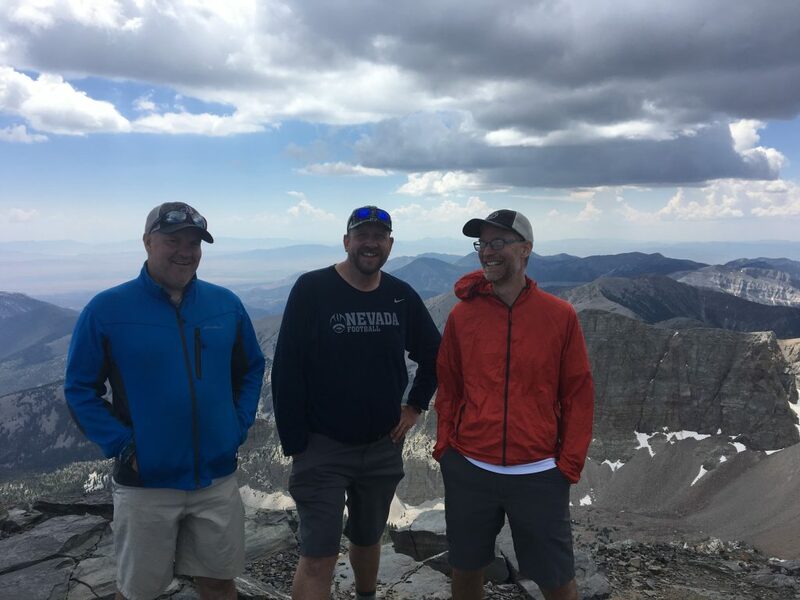 I’ve lived in Nevada since 1991 but my first visit to Great Basin National Park didn’t come until last year, when Shannon and I took the kids on a whirlwind national parks whirlwind tour for spring break. GBNP was the first stop on the trip and we booked the requisite Lehman Caves tour and drove around the park the best we could, as March weather would allow (nothing about the Upper Lehman Caves campground was open at the time). The caves were cool, to be sure, but what stuck with me the most about the quick visit was Wheeler, a stunning snow-capped (at the time) peak in clear view when seen from the east but hidden from view from the heavily trafficked areas of the park. I knew then that it wouldn’t be my last visit to the park and know now that more trips will happen. There’s something terrific about this grand and vast place, and it’s remoteness. I’ll get to the tick-tock on the weekend itself here shortly. But, there’s a singular moment, and view, from this hike that I will never forget — after five-something miles and 3,000-feet of climbing, staring throughout the final miles up at this rocky crest, goal in reach and accomplishment in grasp as you reach the summit ridge to then stumble to this view. 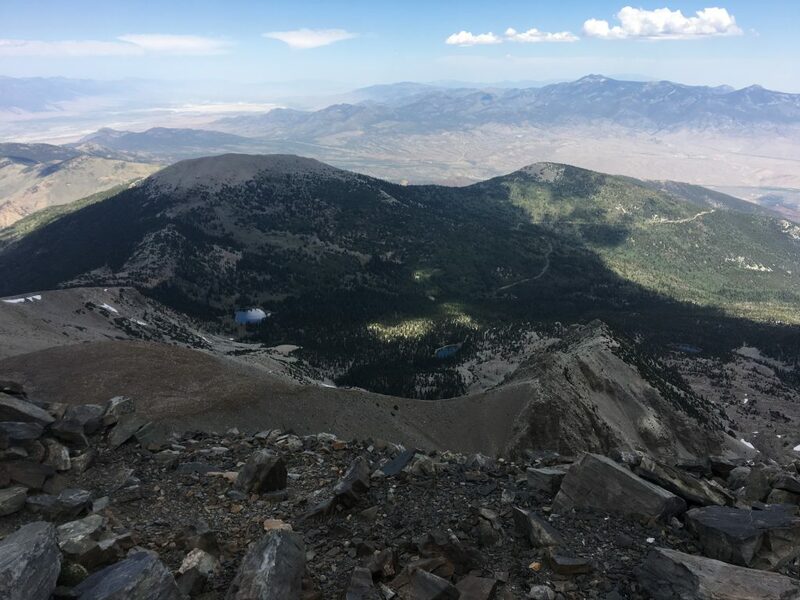 Pano, from the summit of Wheeler Peak, looking south at the Snake Range. Three of us – friends Ryan and Quinn – made the trip out to east central Nevada for the hike. We planned to camp at one of the park’s four campgrounds, which don’t take reservations and, we were told, don’t often fill up. We hit the road on Friday morning with plans to stop for lunch at the Pony Express Deli in Eureka, based on a recommendation from Quinn from a previous trip out on the Loneliest Road in America. The burger was absolutely terrific. I don’t recall exactly when we got to the park – 2 p.m. sounds about right – but we went straight to the Upper Lehman Campground to grab a spot. No luck. That process was repeated, when the same results, at every other campground. Soon we learned about a Utah thing called Pioneer Day and that this three-day weekend for folks from that state meant this was a rare weekend that the park did fill up. This hip restaurant seems completely out of place in Baker, Nev.
We drove back down the hill to Baker, the little town at the turnoff to the park, with a plan to check the lone motel there for vacancy, and if no luck there, to backtrack some 30 minutes towards Ely and camp at some BLM land at Sacramento Pass. The motel was full and on our way out of town, we saw a joint called Whispering Elms, an RV park advertising tent camping as well. The tent space was the luxurious stretch of dirt next to a fence, but at $18.94 (exactly), it suited our needs for the night. 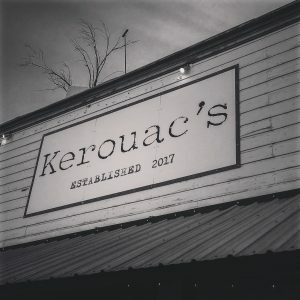 We had dinner and drinks at a cool little joint called Kerouac’s, a popular spot for the park employees on this particular night. We were on the trail by eight on Saturday morning. The trailhead is just over 10,000 feet and we were headed up to 13,063 over the span of five miles. This hike can very easily be separated into two parts. The first half is a nice gradual gain with the hard-dirt trail taking you through the trees and eventually to a ridge. From there, the work really begins as the trail shifts from dirt to rock and cuts across the top of the ridge up the north side of Wheeler. Looking down from the ridge, three lakes pop out and you can see the Upper Lehman campground near bristlecone pine forest. Ryan and Quinn, smooth sailing on the first few miles of the trail. You can start this hike from the campground, and it takes you near Stella Lake and then on a shorter, steeper route to the ridgeline. Ryan had heard some things about back-country camping near Stella Lake and there’s some evidence around the internet that this has been done before, but park rules clearly ban it now. Despite the remoteness of the park itself, cell phone service was not an issue at the top of the mountain. I was able to chat with my daughter back in Reno over Facetime from the peak and gave her a glimpse of some of the terrific views. I could have spent hours at the top, staring in everything direction at the dizzying Horst-and-Graben topography that defines the great state of Nevada and much of the western part of the U.S. and Mexico. From left, Stella Lake, Teresa Lake and Brown Lake. We completed the 10-mile roundtrip in five hours and I’m quite certain it would have been longer than that had it not be for the hailstorm. Atop the summit, we could see clouds building to the south of us, and off in the distance to the west. Shortly after we began the descent, the rain started. It quickly turned to hail and pelted us pretty good for what seemed like an hour but probably was about 20-30 minutes. We moved as quickly as possible during this stretch, as you might imagine, and kept a solid pace for the rest of the way down. Wheeler Peak, glistening after a hailstorm. It’s a good hike, and certainly a good challenge going up past the 13,000-feet mark. We stayed in Ely for the night and spent some time at the Hotel Nevada, the oldest such place in the state. Driving back on Sunday, another burger was devoured, this one at the Middlegate Station between Austin and Fallon. Gear: Save for a pair of Doc Martens that I wore way too much in high school and college, I very much prefer lightweight footwear. It’s a preference that existed playing sports, especially basketball, and it applies to hiking as well. My hiking footwear ranges from some old low-top Columbias (I have no idea the model) and a pair of high-top, yet ultra-light Under Armour SpeedFits. I go back and forth between the two, and they generally work with what I need them for. 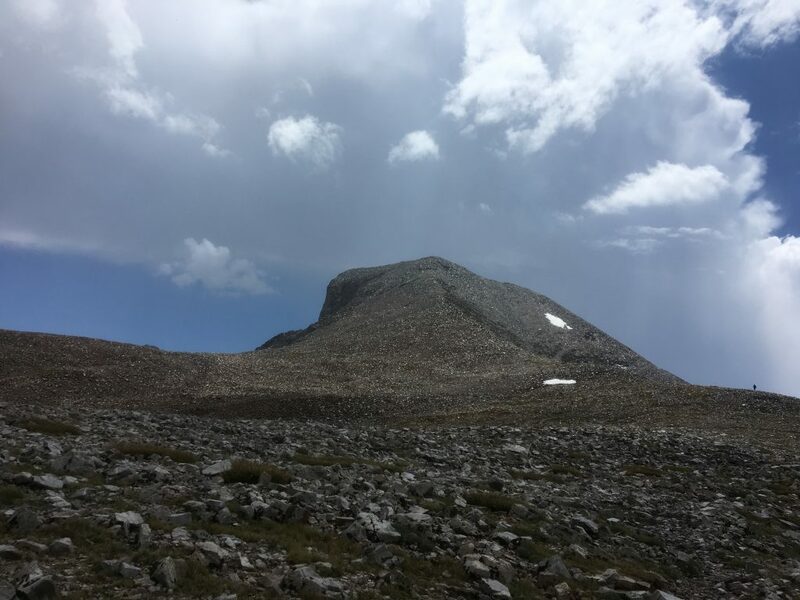 However, with these high-altitude training runs, I’m coming around to the notion that at some point (and maybe very soon), I need to get some durable heavy-duty boots, with the requisite cushioning and support. It was a lesson learned the week before at Boundary and again here at Wheeler Peak. Post-hike beer: Two notable brews here. First, the excellent Lead Dog Brewing in Reno, which has surged near the top of my favorite joints in town, has recently started canning. I pick up a four-pack of Citra Solo for the trip and it was enjoyed as Quinn grilled some terrific sausages while we squatted at a campsite after the hike. Later, we enjoyed a Hotel Nevada IPA from Ruby Mountain Brewing whilst watching the USMNT match at said hotel. As for the latter, I’ve had it previously and it was much better than I remember – a solid IPA. Ryan, me and Quinn at the summit.